This hike was to be a training hike for our upcoming backpacking trip into the Sierra. 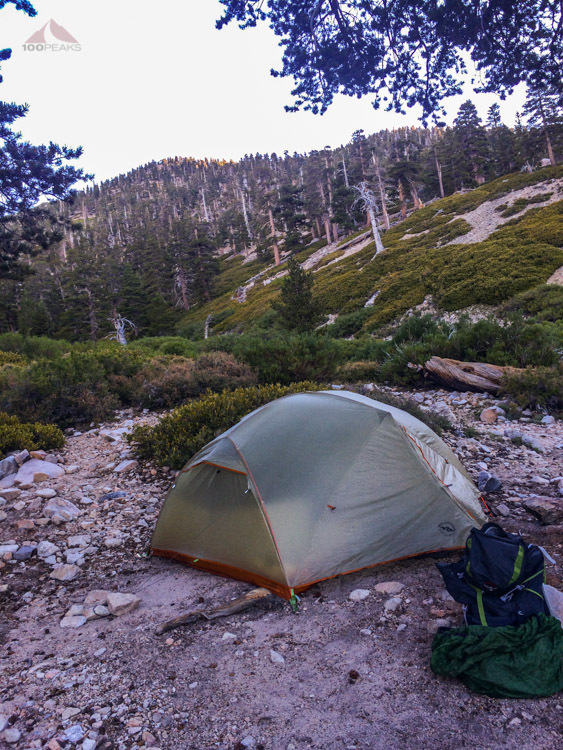 The idea was to do an overnight trip to High Creek Camp and wake up the next morning to summit San Gorgonio Mountain and make it back to the car. Well, half of us made that trip. The PD and I, getting reacquainted now that I am back down here in San Diego, drove to San Bernardino the night before and stayed in a hotel, to prevent us from making a long drive early in the morning. We had a hearty dinner and a great night's sleep. We woke up the next morning and drove to the Vivian Creek Trailhead, meeting Jeff (SoCal Hiker) and his wife, Joan, there. They had a few minutes head start, since the PD and I were lagging behind a bit. I already felt a little tired, but wasn't sure why. Getting out of the car at the trailhead, I scraped my leg on the underside of my car door, creating a gash that started bleeding. I wasn't sure why I was so clumsy. We got on our packs and headed up the trail. It was a pleasant morning, but already warm, hinting at the heat the rest of the day would bring. We crossed Mill Creek to begin the steep hike up to into the Vivian Creek drainage. We were gasping from time to time, since we started at around 6,000' of elevation, but we would gain about 1,000' in the first mile. Once we reached Vivian Creek, the gain was much more reasonable and the area was beautiful. There was water, meadows and great-looking campsites. I could imagine bringing Sophia here, as long as we could get up that first mile. From there, we felt we made great time. My lack of conditioning was definitely rearing its ugly head from time to time, but it was a nice hike. As the trail rose from the drainage, it got noticeably steeper, and we were well over 8,000' at this point. The views to the south and northwest were great as I stopped more frequently to catch my breath. On some nice rocks at the edge of the trail, we stopped for lunch. We weren't too far from High Creek Camp, but we took our time on this section. I made it to camp, grateful to see Jeff and Joan, and promptly sat down. I was tired. Even though the distance from the trailhead to the camp was only around 5.5 miles, we had gone from 6,000' to about 9,400'. Also, my left foot had started to hurt. Stepping on uneven surfaces, like any rock in the trail, would result in a shooting pain in between my two outside toes and the other three. I did some math in my head and started talking myself out of summiting tomorrow. I told the group I would decide the next morning, but before we made it to our tents, I had made up my mind. The PD and I would descend without summiting, so that we could save our legs for the Sierra trip. It was nice to have arrived in camp at an early time. We set up our tent, chatted a while, got some water, had a snack, and then took a nap. This was nice. Dinner was testing out Jeff's tacos, which were excellent, as we shared our beer and wine. The PD and I decided that the weight of camp chairs, which we didn't bring this time, was totally worth it, as we desperately sought comfort around the campsite. We went to sleep, and slept well. I took a benadryl, as my sinuses were going crazy. I was coming down with a cold. 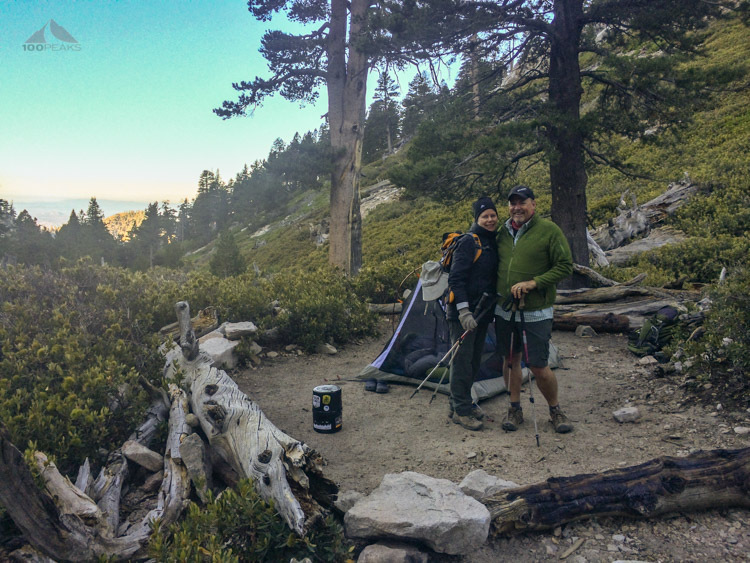 We got up, saw Jeff and Joan off to summit San Gorgonio Mountain, and packed up. We headed down the mountain, making considerably better time on the descent. The views were amazing and the temperature was reasonable. My foot still hurt and it was concerning me and my cold got worse. I was glad I didn't opt for the longer distance. I needed to get some rest if I was going to make it in the Sierra in a few days. The last mile down to Mill Creek was pretty intense. Steep trail coupled with tennis ball-sized rocks made it pretty precarious at times. We made it back to the car. It was hot and the area around the trailhead was filled with people having picnics and barbeques. We had hamburgers and talked about our upcoming trip. That evening, we contacted Jeff and learned that they had gotten back to the car at 7:30PM. 12 hours of steep hiking. I am very glad I made the call to head down.